The beginning of The Sapphires doesn’t bode well. Clichés, caricatures, and shorthand plot devices set us up for a thoroughly predictable, rote affair. By the end, I had come around. I wasn’t wrong about the clichéd shortcuts or the predictability, but the movie clearly isn’t trying to be anything more than a fluff musical, and at that, it succeeds pretty well. Based on a true story, The Sapphires is set in Australia in 1968. If you’ve been paying attention to the international news lately, you’ll know that Australia’s prime minister apologized, just a few weeks ago, for the country’s forced-adoption policy that was in effect leading up to our movie. Pay attention because it applies. Three aboriginal sisters sing well together. Gail (Deborah Mailman) is the oldest, and she plays the guitar. 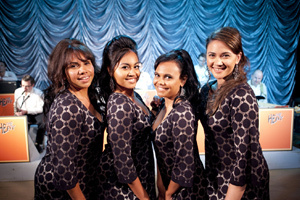 Cynthia (Miranda Tapsell) is the middle sister and Julie (Jessica Mauboy) with the bright voice is the youngest — too young, in fact, to be out singing in bars, according to mum. Nevertheless they set out to win a local talent contest by singing a Merle Haggard tune. The white proprietor awards the prize to someone less talented, but they do get the attention of Dave Lovelace (Chris O’Dowd), musician and emcee. Fate (and a plot device — it’s not important) sends them to Vietnam to sing for the American troops. But not with their country and western repertoire. Dave, a white Irishman, convinces the women that American soul music is what will sell. I suppose you could watch (or read) The Commitments to understand why an Irishman might know about soul music. “Country music is about loss,” Dave explains. “Soul music is about loss,” he continues, making a muddle of his point, which is that country music is about losing and crying in your beer, while soul is about losing and fighting back with all your soul. The sisters don’t feel right without their cousin Kay (Shari Sebbens) who used to sing with them when they were girls. Because she looked white, she was taken away as part of the stolen generation. They save Kay from a life of Tupperware parties and drag her with them to Vietnam. The Sapphires follows the formula. It has the usual scenes of the band forming, earning their fame, finding their name, and working out their differences. The movie tries to impart meaning to their performances, sometimes successfully, as when they sing in their first real nightclub, sometimes unsuccessfully, as when their performance is supposed to salve the wound of Martin Luther King, Jr.’s, assassination. The music is good, and in fact I wish there had been more of it. In one scene, they start to sing “I’ll Take You There,” and twenty seconds later, the scene is fading out and moving us on to the next scene. At 103 minutes it’s not particularly brisk, but it doesn’t feel too long, either. The thing I found most refreshing things about The Sapphires is that none of the four female leads — beautiful as they all are — would pass muster on an American glamour magazine cover. I wish my own country would field more actresses with different ways of being beautiful. The Sapphires lets its actors be beautiful in their own way, not according to a mathematical template of symmetry and slenderness. How odd that characters so exotic — aboriginals born halfway around the world from me, some of whom were stolen from their mothers — are in such a conventional story.